In a word: Lunch, Asian 2.0. 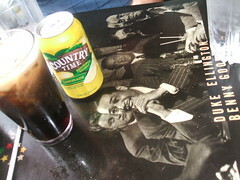 JM ate the BBQ red pork with a lemonade. John ate the pad thai with a soda. Nichole ate the kao poun with a Thai iced coffee. We split an appetizer platter. The bill was $35, or $11.67/person, plus tip. JM gave Rising Sons Deli an A-; John gave Rising Sons Deli a B; Nichole gave Rising Sons Deli an A (see our grading rubric). So, Rising Sons Deli is not actually the kind of deli with a glass counter full of cold cuts and salads. We guess their name is a relic of their previous locations. The decor is enthusiastic, all primary colors, DIY collages of jazz greats and shiny sticky stars, and the kind of fixtures that used to sit in Rubin's front window on Monona Drive for years and years. The best tables are in the "alley" - a skylit gap between ivied brick walls - but it had rained the day we came for lunch, so we stayed inside. 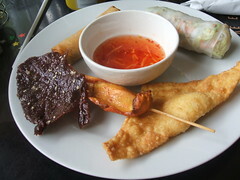 We got a five-appetizer plate that featured our customary rangoon (very crabby, smooth cream cheese); an egg roll (average); a spring roll (thicker than most, stuffed with rice noodles and crispy veg); a chicken skewer (very tender white meat in a peanut marinade); and fried beef jerky. The jerky was our favorite, being chewy, not too salty, with a very meaty flavor still sizzling in its light oil so that when we ripped it apart it almost burned our fingers. As for drinks, we liked having a choice of Coke or Pepsi products, but were disappointed in the tinny-tasting Thai iced coffee. John went for the pad thai, a large portion at a good price. He found it very tasty, neither too sweet nor salty, and ultimately good comfort food. JM's BBQ red pork was also good; the meat tore cleanly under his teeth but was so tender it was in danger of falling apart before then. The drizzle of red sauce on top was not that compelling, though the thin red dipping sauce (same as what came with our appetizers) was tangy and good. He even finished the fresh steamed carrots and broccoli which were crisp and flavorful. The kao poun was a great bowl of noodle soup as big as Nichole's head. 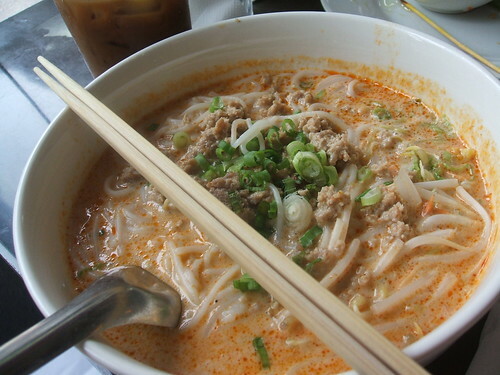 Mild ground pork (and lots of it) sat atop a pile of rice noodles in a coconut-milk-based broth glistening bright orange with fat. A lump of curry paste in the center, just below the surface, once stirred in, made the soup even richer. Nichole found her appetite had escaped well before the broth and noodles were gone, and started fishing out the best bits of meat, carrots, onions, and herbs, abandoning the bit that was not quite worth packing in a takeout box. Earlier, off-list visits to Rising Sons yielded an excellent beef laab and pretty good pho. We liked the use of Creamsicle kisses as after-meal sweet. The only downsides we could find were that they don't take credit and that mosquitoes love their front window. We miss Gumseng, but Rising Sons does pretty much what they did, maybe even better. Creamsicle kisses -- Never heard of them before and a quick online search didn't reveal anything. Do any local stores carry them? Whoops. You may have better luck looking for Hershey's Orange Creme Kisses, or a generic equivalent. I love their drunken noodles. I always mean to try something else there, but I don't imagine I could like it as well. You have to be careful when mentioning that you are going to the Rising Sons Deli. Its name is awfully close to a house of ill repute. 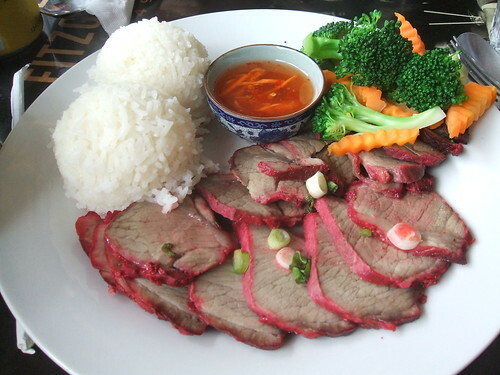 Oooh, that kao poun looks super delicious, I'm definitely trying that sometime. 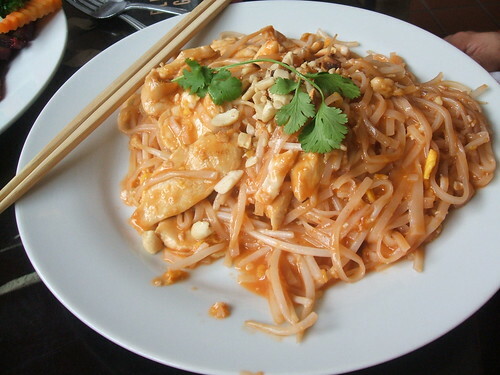 I try to be adventurous at Thai places when ordering, but I like Rising Son's pad thai so much, it's hard not to get it! I love Rising Sons' Pho. It's a perfect lunch for the winter months - it will keep you warm for hours. The price is right too. Very decent curry, fast service. They used to have a lunch buffet too. Worth a visit if on state street and looking for Thai. I too love Rising Sons Deli's beef jerky! I usually get the platter which has the jerky and the very delicious green papaya salad. I don't get down to State Street that often, but it's my go-to place for lunch or dinner if I'm in the area. I'm amazed that someone who had the pad thai at RS could still give them a mere B...RS is the place that made me love Thai, and it was the pad Thai that did it. That said - I also highly recommend the mussuman (sp?) - again, the best I've had anywhere. LOVE this place - can't recommend it enough. 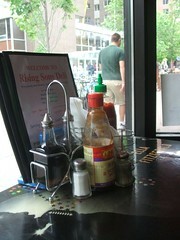 I just have to say your pictures from this outing are fabulous and make me want some Southeast Asian food like crazy. Especially the kao poun -- yum! Wow! It sounds like Rising Sons really hits it out of the park on a lot of dishes. @Karen, I know exactly what you mean - I was already torn between my usuals (laab or pho) but for science, I changed it up - and from now on I'll have analysis paralysis even worse. Their chicken noodle soup (curry/coconut broth, ramen noodles) is one of my absolute favorite dishes in Madison. I also like this place, especially the soup and noodle dishes. Regarding the buffet. It's basically a steam table setup with about 6-8 different offerings. You ask the server for as many different items as you want and pay by the number of items you get. From what they told me, the buffet is only offered during weekdays when school is in session.